Jeff Oster Live! Requirements - Jeff Oster LIVE! 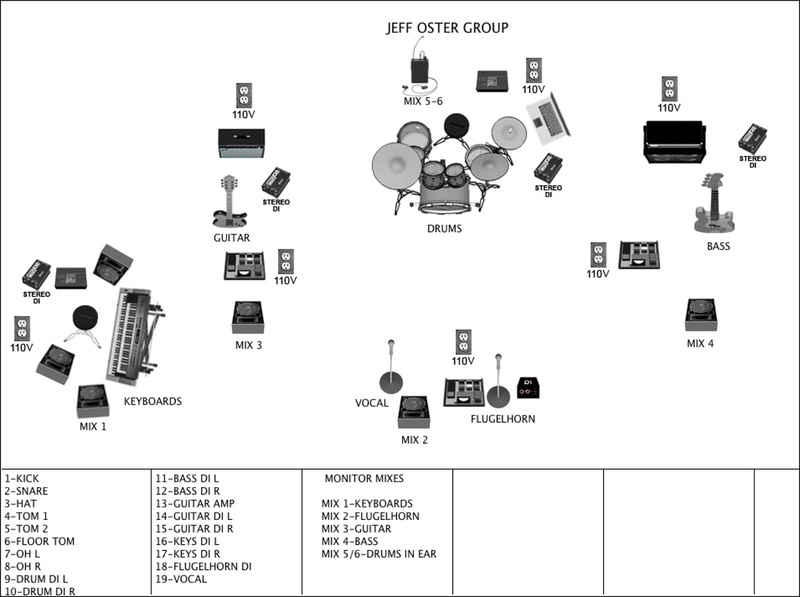 Tech, stage plot and preferred backline requirements needed to put on a Jeff Oster LIVE! performance! -One (1) 22″X 16” OR 20”X16” kick drum. -One (1) 14″X 4” wood snare drum. -One (1) 10″ rack tom. -One (1) 12″ rack tom. -One (1) 16″ floor tom. -Five (5) heavy duty boom cymbal stands. -One (1) heavy duty snare stand. -One (1) round, adjustable heavy duty drum stool. -One (1) carpet 3m X 3m. -One (1) double bass drum pedal (Tama Iron Cobra or DW 5000). -One (1) heavy duty hi-hat stand. CYMBALS: Must be all Paiste brand. -One Pair of 13” Hi Hats. **Note: All drum equipment must be in excellent working condition with new drumheads and no stripped threads. Cymbals stands should have sleeves, felt washers and wing nuts. The 10″ and 12″ toms must be mounted on the bass drum. The floor tom must have legs and not be attached to cymbal stands. The bass drum’s front head must have a hole on it and padding in the inside. -12 Channel Mackie designs mixer or equivalent. Note: All appropriate cables for connecting all the keyboards including one 12 foot midi cable. -One Markbass 121H amp with speakers. -2 XLR lines for stereo DI. -One keyboard bench, drum throne or armless chair. -One Fender Twin Reverb tube guitar amp.